We are on part 5 of this multi-part series. 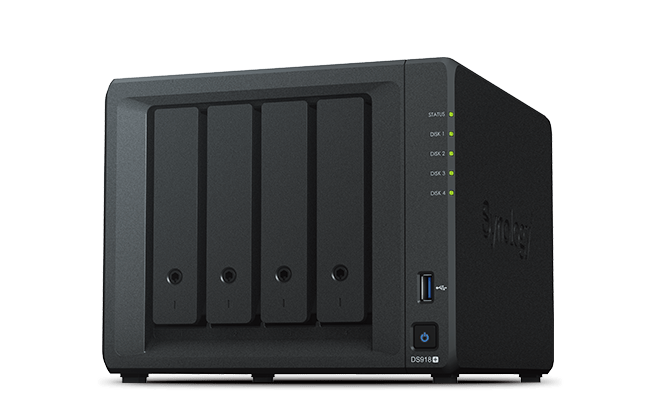 Now we are on the first of 2 parts that are main reason of buying a NAS. 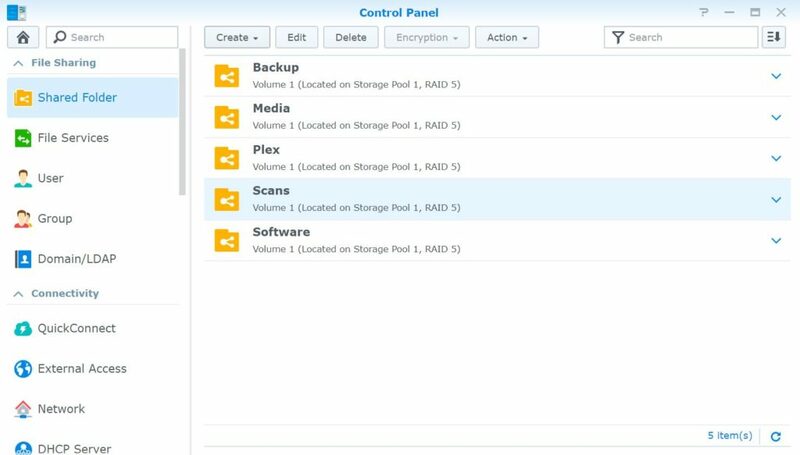 Creating file shares and creating users to access those shares. You can technically can do Part 5 and 6 in any order. So lets get started creating that first Share. On a Synology NAS just like any file server you want to group similar types of shares together. Basically you want have a few top level shares and set group permissions at the top level so the permissions will flow down the file structure through inheritance. This design allows to keep permission structures simple and significantly reduces the need for explicit permissions or explicit permission overrides midway through the file structure. To get shared go to Control Panel and click on Shared Folder. As you can see I’ve already created a few folders for usage and upcoming posts, but luckily I still have more to create. For this demonstration I’ll be creating a Scans Shared Folder for our multi-function printer. Unfortunately, not all every thing my wife and I has a paperless option so on a semi regular basis we still need to scan in documents. To get started click Create and then Create again in the menu. On the first page of the wizard, this is a standard starting point. Give the share a name, this name will be used to connect the share on the network. Generally when you go to a share, it’s by UNC path so in this case the path will be \\NAS IPAddress or Name\Scans. If you want to, you can give the share a description. This description is only visible from the DSM console. There isn’t not a way to see the description from file explorer in Windows or Mac. The next few items are little bit more advanced. 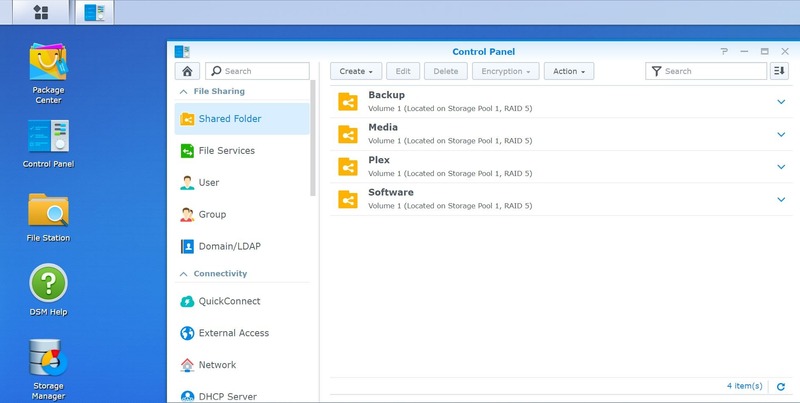 Hide this shared folder in “My Network Places” means you’ll be creating a hidden share. On a Windows machine, to access the share you will go to \\NAS IPAddress or Name\Scans$. The dollar sign is the variable to distinguish that the share is hidden. 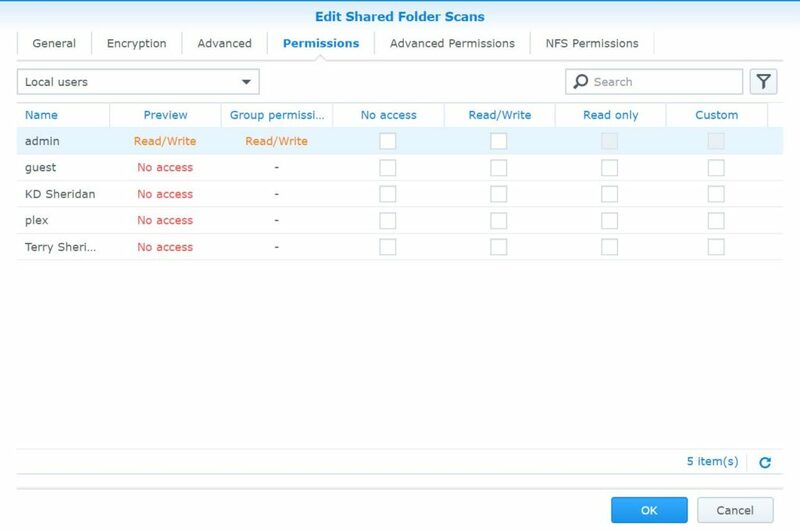 Hide sub-folders and and files from users without permissions means that if the user doesn’t have access to the folder they won’t see it. 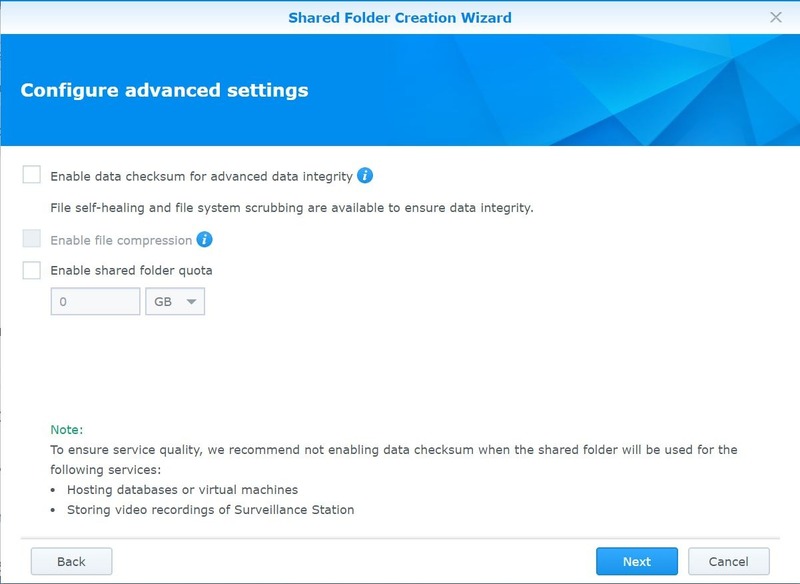 If the box is not checked then the a user can see the folder but will get an access denied error if they try to open it or copy it. If you check the box for this option then the user won’t even see the folder. The last 2 options is about the Recycle Bin. This Recycle Bin works similar to the the Recycling Bin on Windows. It is an easy way to do file recoveries if users accidentally deletes something. Select your options and click Next. On this page you can specify Encryption settings. If you want to set up encryption for the share. To do this you have to specify a password to encrypt or decrypt the folder. In my case the scans folder is just going to be a holding a spot for scanned documents until they are filed to their final storage spot. So intern the folder doesn’t need to be encrypted. Select your encryption options and click Next to continue. The Advanced Settings Page has a few options depending on what you’re using the share for. This option allows the BTRFS File System to heal corruption issues to preserve the file system. This option works in conjunction with the first option. Compression will save on disk space with the trade off of increased CPU usage to decompress files on the fly. 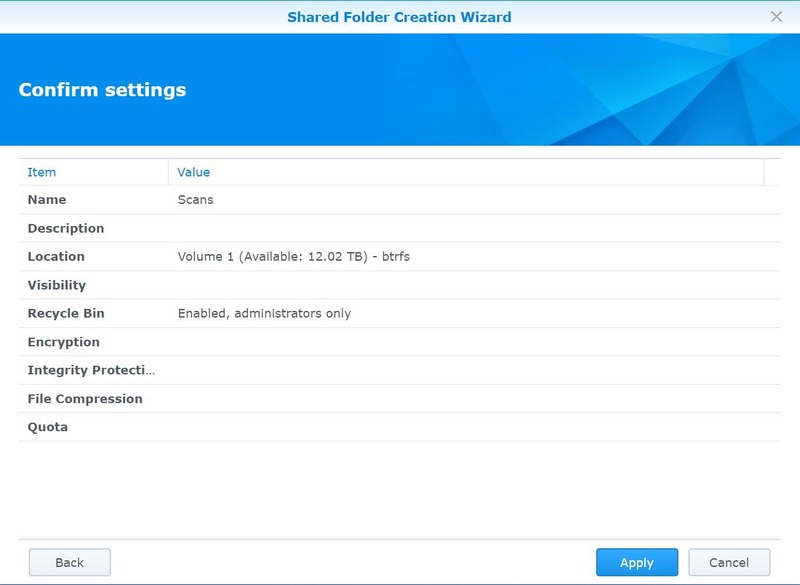 This option allows you to set storage limits on the shared folder so it doesn’t take over the entire NAS. Because of the ever expanding uses for NAS devices there are a couple of warnings about the advanced option at the bottom. In my case I didn’t select any options because this share is a temporary holding place. I did enable the “Enable data checksum for advanced data integrity” option for the plex share. Make your selections and click Next to continue. On the page of the wizard you get to confirm the settings for the new share. Click Apply to continue or click Back to change any of the settings. After the Share Folder is created the wizard brings you to the Permissions page of the shared folder. 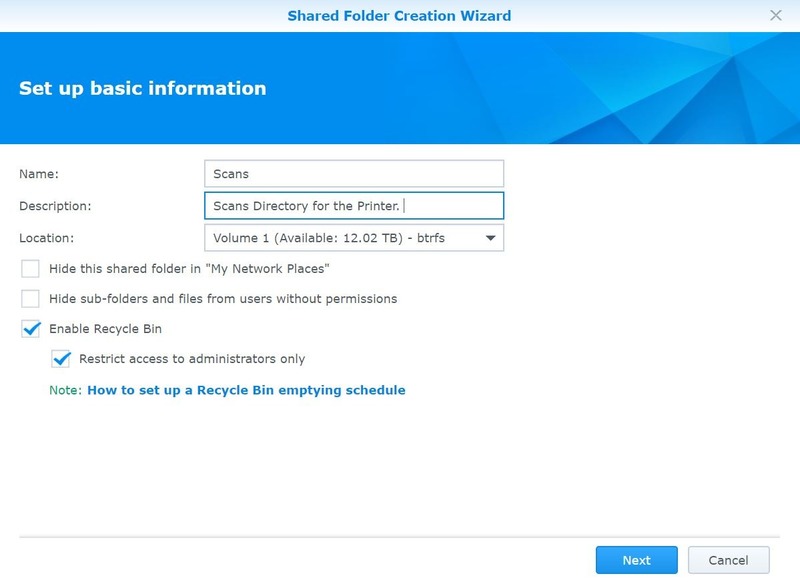 By default only the admin account has access to the new Shared Folder. 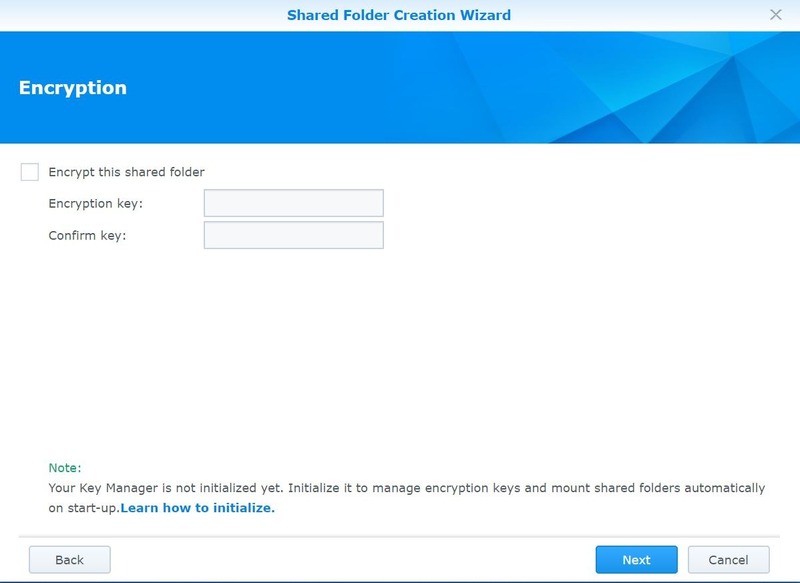 Check the boxes for which users you want to have access to the Shared Folder. Also if you’ve already created groups click on the drop down menu that says “Local Users” and change it to “Local Groups“. If the NAS is joined to an Active Directory this menu will also has “Domain Groups” and “Domain Users” as an option. I selected My Wife and I to have read/write access and clicked OK to set the permissions. When everything is done and configured the new Shared Folder is listed in the list. You can make adjustments to the folder from the Edit button at the top. And that is it. This one is short and sweet. The next one will be about creating users and groups to make managing permissions easier. As always let me know what you think in the comment section or on Twitter.